There is a subsection of crime and mystery fiction which utilises elements of its genre and adds variously surreal, absurd, comedic, period and farcical elements to create a form of genre fiction which can often by lightweightly playful (or to describe it in a less charitable way – a little “silly” or wacky). 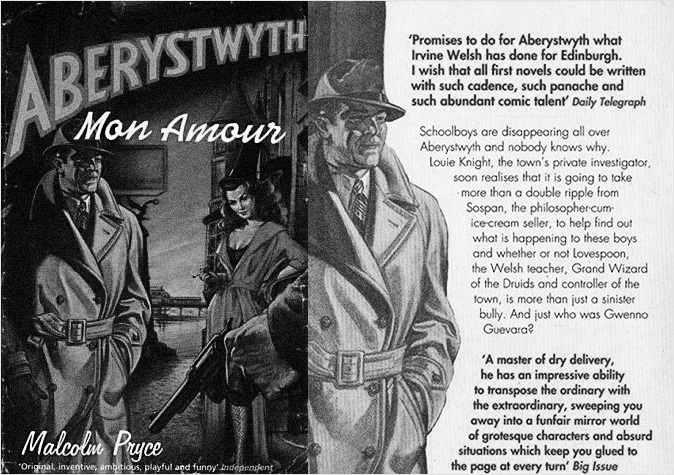 When I first picked up a copy of Malcolm Pryce’s Aberystwyth Mon Amour novel, which has on its cover a noir-ish detective standing opposite a femme fatale in a red dress and a traditional Welsh dress hat, I though it might well belong to that playful/silly subsection of crime fiction. On reading it I discovered that although it is thoroughly entertaining and has some parallels with such work, it is actually a more considered, layered piece of fiction. It could be called a surreal Welsh noir, set in an alternate world where the old ways, magic and druids still abound (albeit within recognisably contemporary structures and society). The book depicts a parallel version of the Welsh seaside town Aberystwyth, which is run by druids who are essentially to all intents and purposes actually “gangsters in mistletoe” and the society depicted within the book is a mixture of a brutal, pagan world and the “real” world. In the town schoolboys keep disappearing and Louie Knight, the town’s private investigator, sets off to solve a multi-layered mystery and conspiracy. 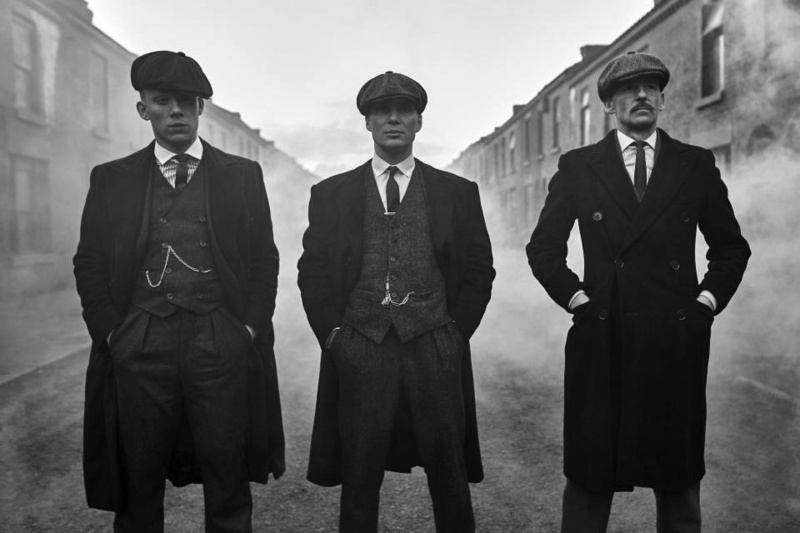 The book has similarities with the British television series Peaky Blinders in the way it mythologises UK crime and organised crime in a not dissimilar manner to that which Hollywood does with its equivalent in America but which is rarely done with British genre work. 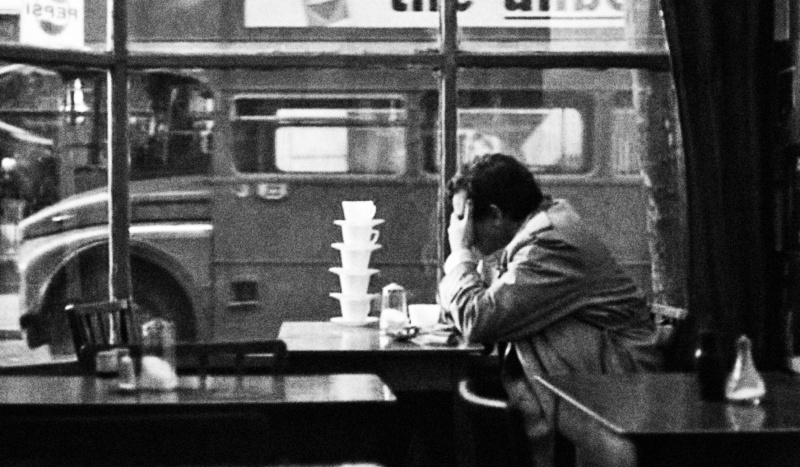 While the book borrows from many of the traditional tropes, themes and signifiers of noir detective fiction, including the central character being an “awkward” detective out to solve the mystery no matter what after he is visited by a femme fatale nightclub singer, it also contains an intriguing disjunctive aspect as amongst such things the traditional signifiers of a British seaside town are an inherent part of the story but without the book stepping into wacky territory; the barman who the detective goes to for solace here is the owner of an ice cream parlour, sticks of traditional Blackpool rock confectionery play a part in the mystery and the all night cafe/bar of noir fiction here is an all night whelk stall. I put another 20p piece down on top of the 50p piece. In this version of Aberystwyth magic and its application are an aspect of life. Within the book there is not an explanation as to why or how magic is used and exists, it just is and in this sense and the way in which the book intertwines such aspects with noir detective/crime tropes it shares parallels with the films Cast a Deadly Spell (1991) directed by Martin Campbell and its sequel Witch Hunt (1994) directed by Paul Schrader, in which a hardboiled private detective named Harry Philip Lovecraft (named after the fantasy/horror writer H.P. Lovecraft) lives in a world where magic is real, monsters and mythical beasts stalk back alleys, zombies are used as cheap labour and everyone, excepting Lovecraft, uses magic on a day-to-day basis. Elsewhere in cinema it also connects with Stephen Frears’ 1971 film Gumshoe, in which a bingo-caller and occasional club comedian in a Northern British city dreams of being a private eye of the kind he knows from films and pulp novels and who almost accidentally becomes involved in solving a mystery, which utilises some of the signifiers of noir detective film but relocates it to an unexpected geographic and cultural locale. Also in its playing with noir genres tropes and relocating them to an unusual, disjunctive setting it also has parallels with Rian Johnson’s 2005 film Brick, which draws heavily from noir fiction but its depiction of a hardboiled detective story is peopled by high school students. While in terms of depicting a British resort gone bad the book shares some territory with Edgar Wright’s 2007 film Hot Fuzz, in which the picture perfect surface of an English country village idyll actually masks a murderous conspiracy – although in Aberystwyth Mon Amour the sense of corruption is hardly masked at all. In some ways Aberystwyth Mon Amour is darker and bleaker than say noir progenitors such as Raymond Chandler’s Philip Marlowe stories. In those although there may be corruption and elements of the hierarchy, authorities and police which are corrupt, these “bad apples” are only a section of society. Whereas in Malcolm Pryce’s book the whole town appears to be either corrupt and/or under the thumb of the druids/the bad guys. By its end the book becomes a curious parable about urban renewal: Louie Knight’s decisions, actions and non-actions unleash a Biblical like flood that both sweeps away all the old vice and corruption but also seemingly the old ways, beliefs, tastes and forms of consumption; the ice cream stall becomes a chain of espresso serving bistros, the 24 hour whelk stall becomes a 24 hour moules marinière stall and so on. This leaves the reader with a curious sense of ambiguity, of being glad that the good guys have trounced the bad and ended the associated corruption and their plans for a Biblical apocalypse but also a slight sense that it has merely been replaced by a form of cultural cleansing and an associated cultural superiority/smugness and almost a sense of not quite being sure who won or if indeed they did.